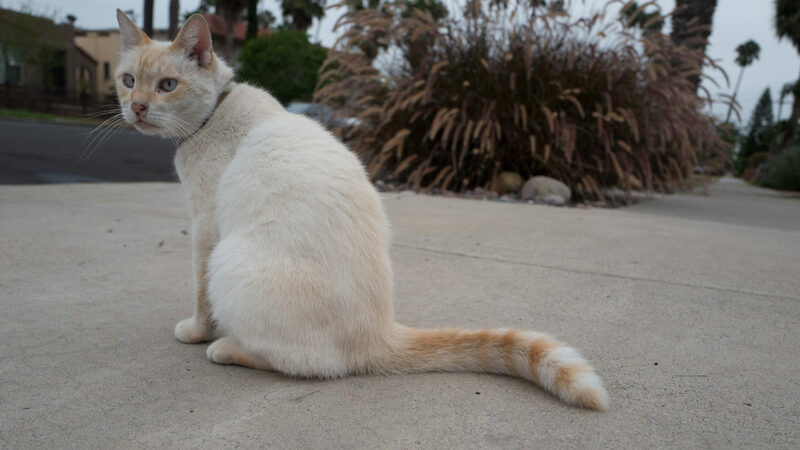 The sudden, and unexpected, recent discovery of new neighborhood felines (five in two days), makes this site look like a cat blog, which it most certainly isn’t. I met three on Alabama Street, day-before-yesterday. Goldie is second of the trio. The kitty approached, strutting behind Itchy Valentino, as I walked from Adams towards Madison. I shot the Featured Image, using Leica Q, on Sept. 5, 2017, at 8:48 a.m. Soon afterwards, a mom walking kids to school passed by. One of them knew the kitty’s name, which she said, and I later forget—embarrassingly. 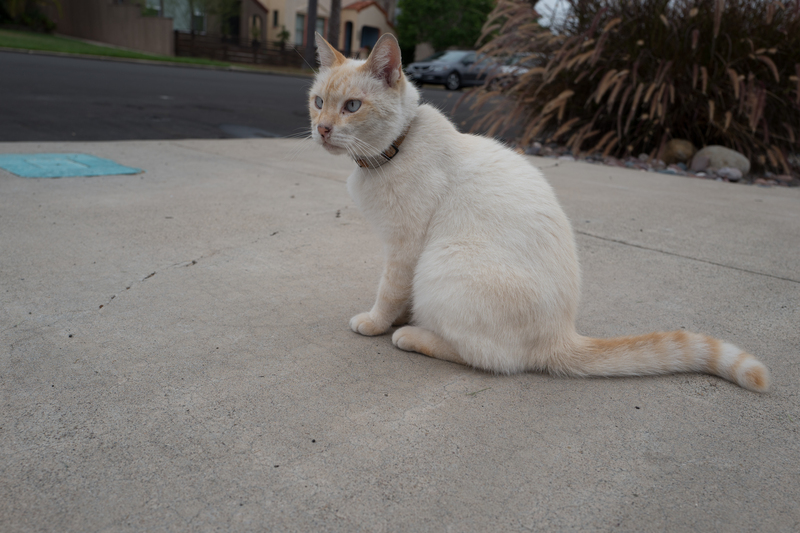 Yesterday, I walked back, luckily finding Goldie lounging on the sidewalk; name is on her collar. For matters of taste, I prefer the second photo, which is cropped 16:9, despite its odd composition. That’s the only reason for presenting two—much as Goldie deserves more. Can you see that he’s a little cross-eyed? Vitals, same for both images, aperture manually set: f/5.6, ISO 100, 1/250 sec, 28mm. Neither pic is otherwise retouched. Blasts from the past: Scruffy, Roly Poly, Woo, Skull, Biscuit, The Colonel, White, Chipper, Frisky, Stretch, Needy, Farfisa, Mates, Hunter, Pee-Pee, Blue, Blue Too, Bonded Pair, Patience, Fess, Jumper, Frenemy, Looker, Cozy, Scout, Lurks, Skit, Mini, Betty, Black and White, Stalker, Bell, Chill, Sammy, Scratch, Poser, Star, Grey and White, Watcher, Herman, Comet, Roman, Willow, Chub, Nimbus, Watson, Lilo, Kit, Pepe, Twilight, Sebastian, Spot, Booger, Ash, Veruca, Riley, Mellow, Bonde, Flower, Glass, Black, BeBe, Fang, Bruce, Siamese, Pounce, Tortie, Haiku, Fraidy, Peso, Daniel Tiger, Dusk, Stride, Dainty, Spry, Tabby, Betty Too, Still, Levi, Shadow, Sophie, Wink, Ferals, Momma, Charlie, Tux, Cool, Benny, Jellicle, and Itchy Valentino.